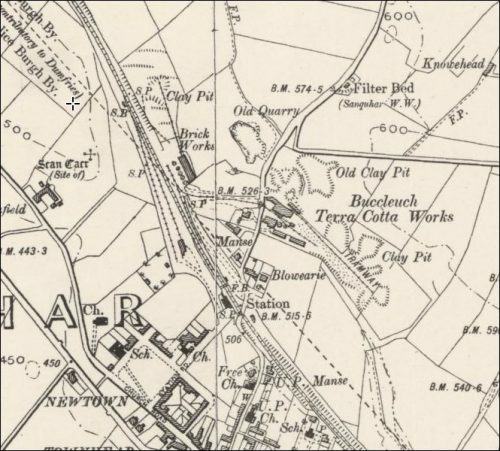 Info p32– The Kirkconnel and Sanquhar coal-beds lie in an area measuring nine miles long with a breadth averaging from two to four miles, and is an extension of the Ayr coalfield. The strata descend I2OO feet, and the coal measures lie above the depressed surface of that part of the Silurian area which a fault has lowered. In different seams, with intervening strata, are found “creepie” coals, calmstone, twenty-inch, daugh, splint and swallow-craig coals. In one-half of the field, lying to the south-west, three doleritic dykes, throwing out intrusive sheets, disturb the measures and render the working of coal unprofitable there. In Upper Nithsdale the Silurian barrier did not sink beneath the sea-level till the latter part of the Carboniferous period. At . Sanquhar red marls and clays, lying in the upper part of the coal measure, are available for the manufacturing of bricks, terra-cotta, pottery, tiles, etc. The making of bricks is an industry which has flourished in this district for centuries. Perhaps the earliest notice of it is to be found in the Earl of Queensberry’s letter to his factor relative to certain repairs on the Castle at Sanquhar, which will be found at the end of the third chapter. There seems, however, reason to believe that bricks of a rough make were in use here even prior to that date (1688). Abundance of clay, excellently adapted for the purposes of brick-making, had always been readily accessible in the lands immediately to the north of the town. 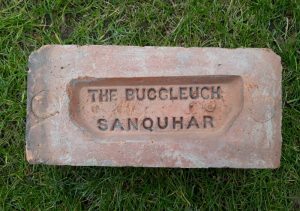 The character of a great portion of the land on that side, from Ryehill for some miles westward is a stiff clay ; but, in the vicinity of Sanquhar, it is of that particular description of which the hardest and most durable bricks can be made. There are still traces of the ancient brickfields here, where work has been carried on from time to time for generations, and the name ” Bricklands,” which had been given to this part, was doubtless derived from the brick-making industry. For some time in the first half of this century, no work of the kind was done, but the growing demand for bricks for building purposes, and likewise for draining tiles, in consequence of the extensive introduction, about the year 1850, of the system of draining by tiles, led to the opening in 1852 by Mr Geo. Clennel ( variation Cleunel ) of a brick and tile work in a part of the field adjoining that previously worked. A large and prosperous trade was done for many years so long as the draining mania lasted, but latterly the trade fell off, partly through the want of capital to adopt the improved machinery that had meanwhile been introduced. Mr Clennel was succeeded in 1889 by another tenant, Mr James Brodie. 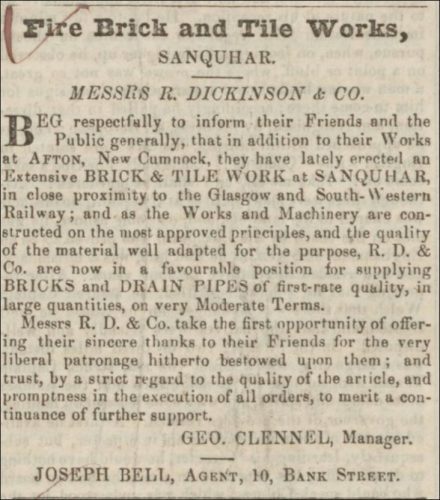 Below – 04/10/1852 – Dumfries and Galloway Standard – Messrs Dickinson announce that in addition to their Afton Brickworks, New Cumnock they are now opening an extensive brick and tile works at Sanquhar. George Clennel is manager. Below – 04/10/1854 – Dumfries and Galloway Standard – Sanquhar Brick and Tile Works, Messrs R Dickinson and Company beg beg to intimate to Proprietors and Tenants, and to the Public generally, that they have sold and transferred the above works, with the good will of the business, to their Manager, Mr George Clennell, and confidently trust, from his long experience and knowledge of the business, that the same success will attend him which they have all along experienced. Mr Clennell will receive and pay all accounts due to and by the Company. 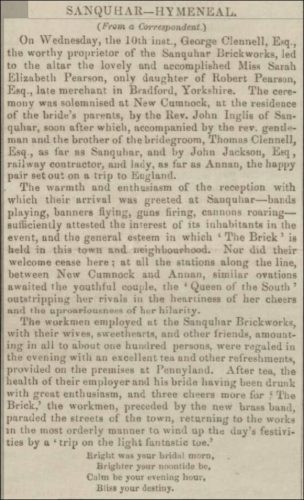 18/08/1858 – Dumfries and Galloway Standard – Sanquhar Brick and Tile Works. Mr Geroge Clennell, Sanquhar, has appointed Samuel Cavan, Merchant, Kirkcudbright, Agent for the above works in Kirkcudbright, Gatehouse, and neighbourhood. Delivery can be made at any of the shipping ports in the district. Prices and other particulars learnt on application to Cavan. 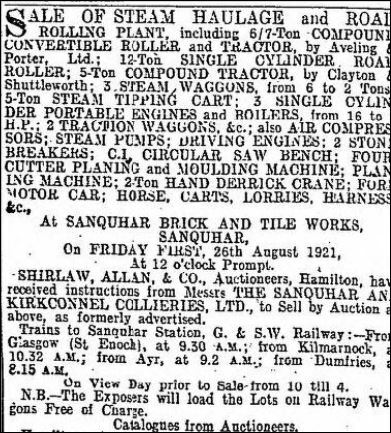 Sanquhar, 12th August 1858. 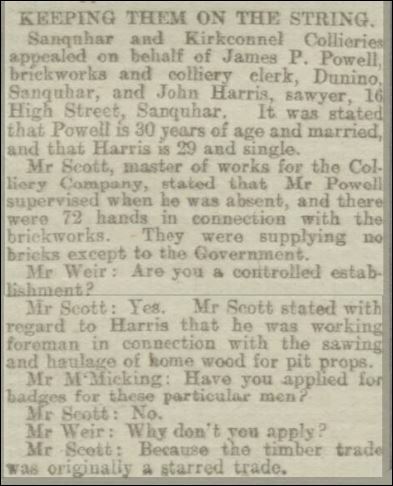 23/03/1859 – Dumfries and Galloway Standard – Sanquhar Brick and Tile Works – James Derby, coal agent, Auldgirth, begs to intimate to the proprietors and farmers in his District, that Mr Clennell has appointed him agent for the above works at Auldgirth. Prices moderate; and a supply constantly on hand at Auldgirth Station. 17th March 1859. 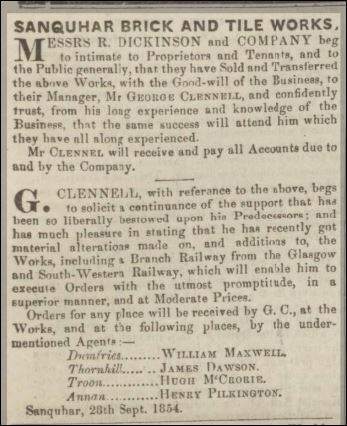 20/05/1859 – Carlisle Journal – Sanquhar Brick and Tile Works – Richard Wright, Builder, 22 Abbey Street, Carlisle, begs to intimate to the proprietors and farmers of the District that Mr. Clennell has appointed him agent for the above works at Carlisle. Samples can be seen, and prices learned, on application to Wright. 19th May, 1859. 1867 – George Clennel, Brick and Tile Works Sanquhar. 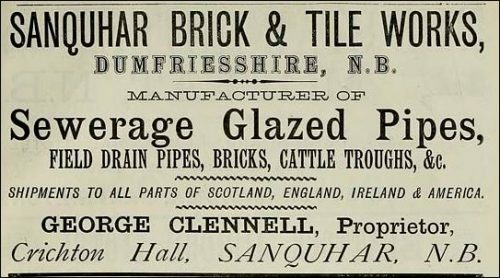 1867 – Below advert Sanquhar Brick and Tile Works, George Clennell. 1867 – Joseph Clennel, Brick and Tile Works Manager, Pennyland Cottage, Sanquhar. Mr James Brodie, who has largely improved and extended the works, which are now in a complete state, and embrace five Newcastle Kilns and a Staffordshire Oven. The improved plant includes a machine for the production of pressed bricks for outside building. Below – 1886 – Sanquhar Brick and Tile Works, Dumfriesshire. George Clennell. 1889 – James Brodie may have taken over from George Clennel around this time. 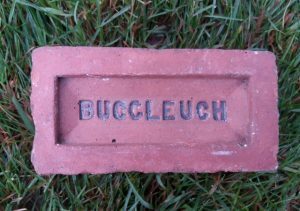 28/11/1895 – Southern Reporter – Fatal accident at Sanquhar – On Thursday afternoon a young man named Joseph Lindsay, resident at Crawick Mill, was so severely crushed by a fall of clay at the Buccleuch brick and tile works, Sanquhar that he only survived a short time after being removed home. 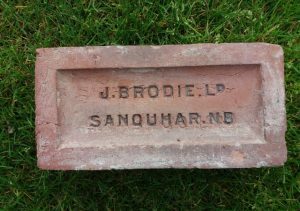 1910 – 1911 and again 1912 – 13 – The Isherwood Bros also made bricks at the Sanquhar Brick and Tile Works. c. 1912 – 1913 – The works were obtained by Sanquhar & Kirkconnel Collieries Limited. 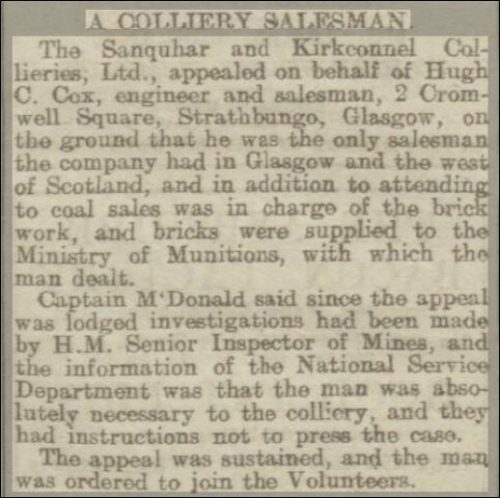 28/03/1912 – Dundee Courier – Sanquhar men still returning – A further resumption of labour was made yesterday at all three pits belonging to the Sanquhar and Kirkconnel Collieries, Ltd., 143 men returning to work at Gateside Pit, Sanquhar, while 37 miners made a restart at the Fauldhead and Elise Pit, Kirkconnel. 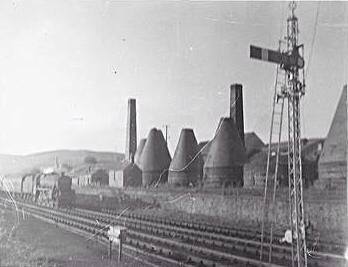 Coal is also being drawn at the new mine situated in proximity to the Sanquhar Brick and Tile Works, which is also owned by the Collieries, Ltd. A number of Union men are still working. The total number present work at the local pits represents an increase of fully 30 since Monday. There was no picketing. 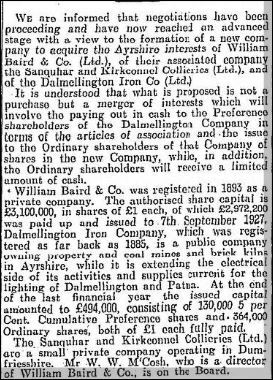 All the other local industries have now got a copious supply of coal, and are working full time, with the exception of the Nithsdale Hosiery Factory, which is meantime closed. Reports are to hand of a New Cumnock policeman being roughly handled by gang lads. Below – 13/09/1916 – Dumfries and Galloway Standard – Appeals to the Miilitary Service enlistment. 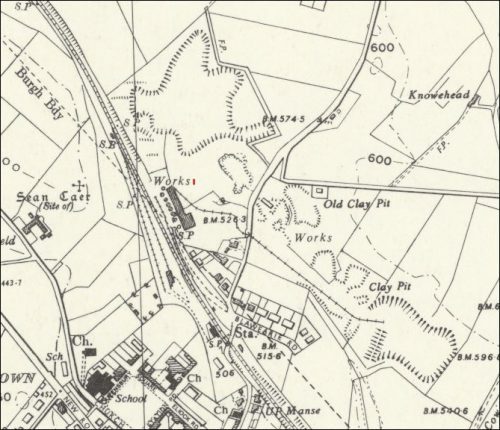 19/12/1917 – Dumfries and Galloway Standard – Accident at Sanquhar Brickworks – Yesterday afternoon, while John Nicholas, who resides with Mrs Caldwell, Castle Street, was engaged shunting waggons in the siding at the main line, he got his right hand jammed between the buffers of two waggons, with result that part of his thumb and forefinger were smashed. He was attended to by Dr Dunlop, and afterwards proceeded home. 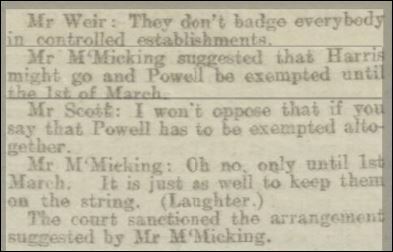 Below – 17/04/1918 – Dumfries and Galloway Standard – Appeals to the Miilitary Service enlistment. 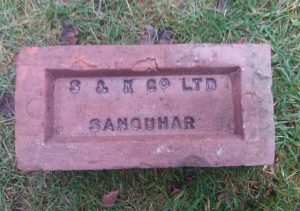 19/01/1921 – The Scotsman – Glasgow Housing Committee and brick supply – The Director of Housing reported to the Housing Committee of Glasgow Corporation that he had been in commumcation with the Sanquhar Brick Company regarding facing bricks, and had arranged to take a supply at a price of 160s per 1000. 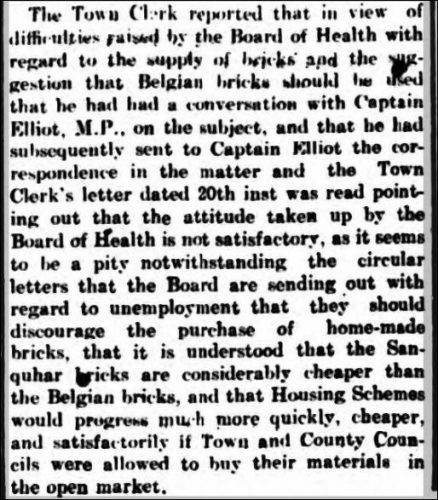 The Scottish Board of Health however had refused to sanction the use of bricks at that price, although the cost of similar bricks obtained through the Department of Building Material Supply, including transport, was higher . 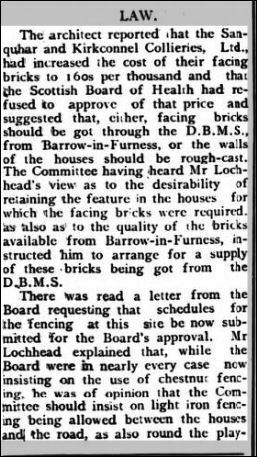 The Committee decided to instruct the Director to secure the bricks and to again take up the matter with the board. 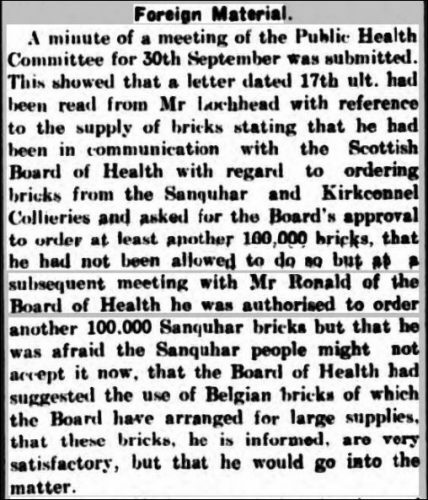 Below – 14/10/1921 – Carluke and Lanark Gazette – Lanark Town Council – Sanquhar bricks versus Belgian imported bricks. 1925 – 1931 – William Baird & Co Ltd ran the Buccleuch Terracotta Works. 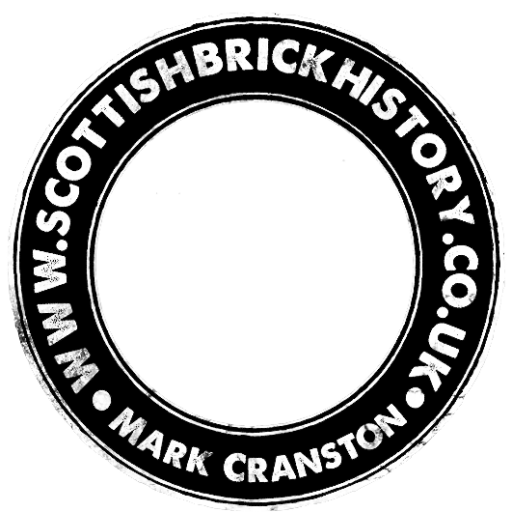 – Source Brick, Tile and Fireclay Industries in Scotland RCAHMS. (Note – SBH – I would imagine this included the Fauldhead Colliery Brickworks and the Sanquhar Brick and Tile Works). 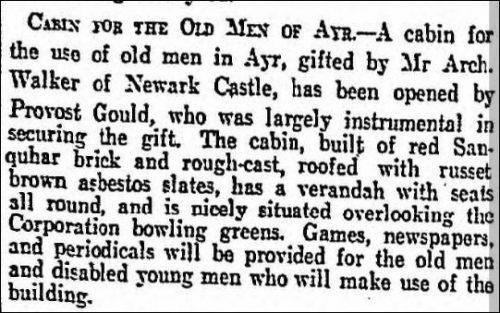 Below – 15/1927 – The Scotsman – Building erected with Sanquhar bricks for use of elderly men in Ayr. 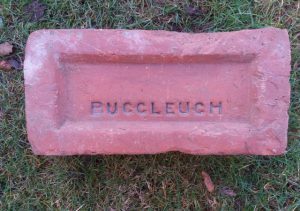 1931 – 1947 – The Baird and Dalmellington Iron Company Limited ran the Buccleuch Terracotta Works – Source Brick, Tile and Fireclay Industries in Scotland RCAHMS. (Note – SBH – I would imagine this included the Fauldhead Colliery Brickworks and the Sanquhar Brick and Tile Works). 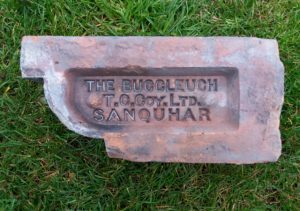 Below – 1950 – 1967 – Sanquhar Brick Works. 1962 – Sanquhar and Kirkconnel Collieries Ltd were wound up. George Clennell – In Loving Remembrance of Thomas George Clennell, who died 5th November, 1868, aged 11 months. Also of George Edward, who died 20th October, 1871, aged 3 months. George Clennell, father of the above, who passed away 23rd December, 1900, aged 71 years. George Clennell was a native of the county of Durham. He came to Sanquhar in 1852 as manager of the Brick Works erected in that year by Robert Dickenson of the Consett Fire Brick Manufactory, Shotley-Bridge, Durham. Ultimately he became sole proprietor of the works. Associated with Mr George Clennell in the management of the Brick Works was his brother, Mr Joseph Clennell, now resident at Rabey Villa, almost a nonagenarian, but still hale and hearty. George Clennell some years before he died sold the Brick Works to a Mr Brodie, who carried them on with success for several years; Messrs Isherwood Brothers afterwards owned them, and latterly Mr Scott; now they are the property of the Sanquhar and Kirkconnel Collieries Company. 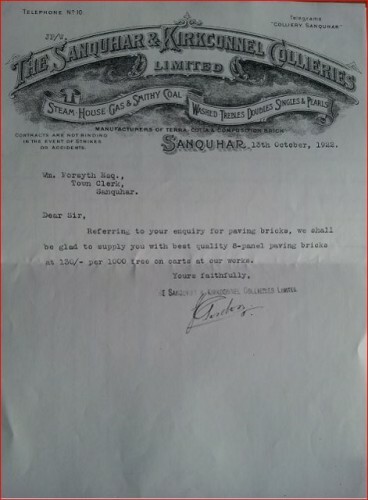 Mr Clennell left Sanquhar in 1889, and for some years was engaged in the wholesale wine trade. He died, as his tombstone states, on the 23rd December, 1900, at the age of seventy-one. His wife was Miss Sarah Elizabeth Pearson, Bradford. She died in London in 1908. They had a family of 3 sons and five daughters. Below -Unknown date. – Sanquhar Brickworks.